The Relate ticket option can be used to relate multiple tickets pertaining to the same issue to a single ticket. 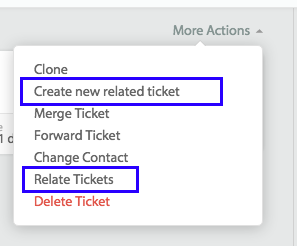 You can also Create a new related ticket to the current ticket you are working on. This way tracking the tickets with a similar issue will be easier and all the affected customers can be notified about any updates accordingly. 1. Open a ticket which you would like to relate. 2. Click on More Actions and then click Related Tickets to relate an existing ticket or click Create new related ticket to create a new incident. 3. 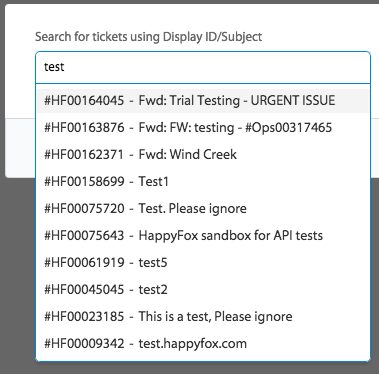 In the dialog box that appears, search for the ticket using ticket ID or Subject. 4. Select the tickets to be linked and click Add as related. 5. Once you add the related tickets, they will appear in the Related Tickets section at the bottom of the ticket details page. 6. You can also send a bulk update to all the contacts by clicking Send Mass Reply.